Introduction: Trauma, altered tooth germ position and delayed tooth eruption have been hypothesized as possible causes of tooth root dilacerations and flexion, however these anatomical variations appear more commonly associated with posterior teeth and absence of traumatic history. The Hypothesis: Postulated is that tooth root dilaceration or flexion may be a result of tooth root sheath displacement due to gradients of bone remodeling present within alveolar bone. Evaluation of the Hypothesis: Alveolar bone displays bone remodeling gradients between coronal, apical and basal sections which affect bone plasticity. As a tooth is erupting or experiences delayed eruption, there are other relative dento-skeletal alterations occurring, such as the mesial drift of the dentition and transverse growth of the maxilla. It is plausible that during the physiologic and growth related alteration of the alveolar and basal bones, portions of developing tooth could be found within one or more of the plasticity zones, contributing to alteration of the root sheath and tooth root dilaceration. Tooth root dilaceration associated with trauma is less prevalent than atraumatic dilaceration observe on posterior teeth and therefore primary causation of tooth root dilaceration hypothesized as a result of trauma is limited. The altered tooth germ hypothesis is inadequate to explain instances of tooth root dilaceration that seem to initiate at the midroot level or further apical, and a delayed eruption hypothesis is inadequate to explain why tooth root dilaceration formation occurs in situations of normal eruption especially when observed of mandibular molars. The proposed hypothesis describes tooth root dilaceration and flexion resulting from tooth root sheath displacement due to gradients of plasticity present within the alveolar bone. The traditional understanding of root dilaceration and flexion has been postulated from observation of dental trauma and the hypothesis of atraumatic altered tooth germ position. The proposed hypothesis supplements traditional theories of tooth root dilaceration etiology by considering the dynamic physiology of the orofacial skeleton. Tooth development and eruption occur in stages and individual tooth stages can occur at different ages. Succedaneous and non succedaneous permanent teeth development begins from an ectomesenchymal primordium, which for succedaneous teeth develops in association with the primary tooth bud. Damage or dislodgment of the primary tooth might alter the position of the permanent tooth; however, this is inadequate to explain the occurrence of dilaceration at the midroot or apical level instead at the cervical 1/3 of the tooth. Teeth develop from this primordial ectomensenchyme through a bud stage, cap stage and then bell stage, in which the ectomesenchyme initiates differentiation of the ameloblasts that are responsible for the development of tooth enamel and  odontoblasts, which are responsible for the development of the dentin. Following differentiation to ameloblast and odontoblasts, progressive mineralization of tooth crown occurs until the cervical region is reached and there is a progression to root formation through Hertwig's root sheath. , Eruption of the tooth seems to result from a combination bone resorption preceding the crown, along with a periodontal ligament/root mediated eruption process. ,,,, Root sheath stretching occurs as the tooth root grows from a stationary origin in the bone, rather than the root sheath growing into the jaws,  and the relative amount of eruption displayed by primary and permanent teeth may affect the amount of alveolar bone that an adjacent unerupted permanent tooth may need to pass through prior to emergence into the mouth. Plasticity zones are more easily visualized but it is likely that gradients of plasticity occur rather than distinct zones. Compounding local or systemic factors affecting development of tooth root dilaceration relative to bone plasticity gradients could include the rate of eruption, jaw rotation, length of the root, length of eruption path,  delayed eruption,  transverse uprighting of molar teeth during eruption ,, and root resorption. 1. Topouzelis N, Tsaousoglou P, Pisoka V, Zouloumis L. Dilaceration of maxillary central incisor: A literature review. Dent Traumatol 2010;26:427-33. 2. Chohayeb AA. Dilaceration of permanent upper lateral incisors: Frequency, direction, and endodontic treatment implications. Oral Surg Oral Med Oral Pathol 1983;55:519-20. 3. Hamasha AA, Al-Khateeb, Darwazeh A. Prevalence of dilaceration in Jordanian adults. Int Endod J 2002;35:910-2. 4. Proffit WR, Fields HW, Sarver DM. Contemporary Orthodontics, 5 th ed. St. Louis: MI: Elsevier; 2012. 5. Jafarzadeh H, Abbott PV. Dilaceration: Review of an endodontic challenge. J Endod 2007;33:1025-30. 6. Regezi JA, Sciubba J, Oral Pathology: Clinical-Pathologic Correlations, 2 th ed. Philadelphia: WB Saunders Company; 1993. 7. Udoye CI, Jafarzadeh H. Dilaceration among Nigerians: Prevalence, distribution, and its relationship with trauma. Dent Traumatol 2009;25:439-41. 8. Viecilli RF, Budiman A, Burstone CJ. Axes of resistance for tooth movement: Does the center of resistance exist in 3-dimensional space? Am J Orthod Dentofacial Orthop 2013;143:163-72. 9. Wei YJ, Lin YC, Kaung SS, Yang SF, Lee SY, Lai YL. Esthetic periodontal surgery for impacted dilacerated maxillary central incisors. Am J Orthod Dentofacial Orthop 2012;142:546-51. 10. Miloglu O, Cakici F, Caglayan F, Yilmaz AB, Demirkaya F. The prevalence of root dilacerations in a Turkish population. Med Oral Patol Oral Cir Bucal 2010;15:441-4. 11. Malcic A, Jukiæ S, Brzoviæ V, Miletiæ I, Pelivan I, Aniæ I. Prevalence of root dilaceration in adult dental patients in Croatia. Oral Surg Oral Med Oral Pathol Oral Radiol Endod 2006;102:104-9. 12. Zeichner-David M, Vo H, Tan H, Diekwisch T, Berman B, Thiemann F, et al. Timing of the expression of enamel gene products during mouse tooth development. Int J Dev Biol 1997;41:27-38. 13. Thesleff I, Keranen S, Jernvall J. Enamel knots as signaling centers linking tooth morphogenesis and odontoblast differentiation. Adv Dent Res 2001;15:14-8. 14. Zeichner-David M, Oishi K, Su Z, Zakartchenko V, Chen LS, Arzate H, et al. Role of Hertwig's epithelial root sheath cells in tooth root development. Dev Dyn 2003;228:651-63. 15. Ten Cate AR. Oral Histology: Development, Structure, and Function, 4 th ed. St. Louis, MI: Mosby; 1994. 16. Ten Cate AR. The role of epithelium in the development, structure and function of the tissues of tooth support. Oral Dis 1996;2:55-62. 17. Wise GE, King GJ. Mechanisms of tooth eruption and orthodontic tooth movement. J Dent Res 2008;87:414-34. 18. Carollo DA, Hoffman RL, Brodie AG. Histology and function of the dental gubernacular cord. Angle Orthod 1971;41:300-7. 19. Wise GE, Lin F. The molecular biology of initiation of tooth eruption. J Dent Res 1995;74:303-6. 20. Huja SS. Beck FM. Bone remodeling in maxilla, mandible, and femur of young dogs. Anat Rec (Hoboken) 2008;291:1-5. 21. Huja SS, Fernandez SA, Hill KJ, Li Y. Remodeling dynamics in the alveolar process in skeletally mature dogs. Anat Rec A Discov Mol Cell Evol Biol 2006;288:1243-9. 22. Roberts W. Bone Physiology, Metabolism, and Biomechanics in Orthodontic Practice, in Orthodontics: Current principles and techniques. In: Graber TM, Vanarsdall RL, Vig KW, editors. Elsevier Mosby: St. Louis; 2005. p. 221-92. 23. Tricker ND, Dixon RB, Garetto LP. Bridging the gap between dental and orthopaedic implants. In The Indiana Conference, 3 rd ed. Indianapolis Indiana: Indiana School of Dentistry; 2002. 24. Roberts W, Huja S, Roberts J. Bone. Modeling: Biomechanics, molecular mechanisms, and clinical perspectives. Seminars in Orthodontics 2004;10:123-61. 25. Roberts WE, Hartsfield JK Jr. Bone Development and Function: Genetic and Environmental Mechanisms. Seminars in Orthodontics 2004;10:100-22. 26. Roberts WE, Roberts JA, Epker BN, Burr DB, Hartsfield JK Jr. Remodeling of Mineralized Tissues, Part I: The Frost Legacy. Seminars in orthodontics 2006;12:216-37. 27. Thilander B, Rygh P, Reitan K. Tissue reactions in orthodontics, in Orthodontics: Current Principles and Techniques. In: Graber TM, Vanarsdall RL, Vig KW, editors, 4 th ed. Elsevier Mosby: St. Louis; 2005. p. 152-7. 28. 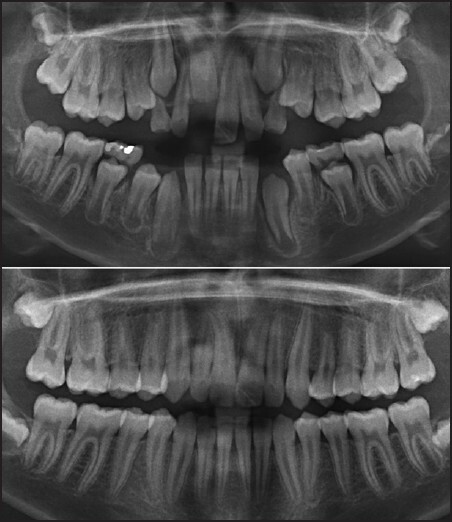 Bjork A. Skieller V. Growth of the maxilla in three dimensions as revealed radiographically by the implant method. Br J Orthod 1977;4:53-64. 29. Johnston LE. Growing jaws for fun and profit: A modest proposal, in What Works, What Doesn't, and Why. Craniofacial Growth Series 35. In: McNamara AJ, editor. Needham Press: Ann Arbor; 1998. p. 63-83. 30. Bjork A, Skieller V. Facial development and tooth eruption. An implant study at the age of puberty. Am J Orthod 1972;62:339-83. 31. Isaacson R, Erdman A, Hultgren B. Facial and Dental Effects of Mandibular Rotation, in Craniofacial Biology Craniofacial Growth Series No. 10. In: Carlson D, Ribbens K, editors. Ann Arbor: Center for Human Growth and Development, The University of Michigan; 1981. 32. Iwasaki LR, Chandler JR, Marx DB, Pandey JP, Nickel JC. IL-1 gene polymorphisms, secretion in gingival crevicular fluid, and speed of human orthodontic tooth movement. Orthod Craniofac Res 2009;12:129-40. 33. Iwasaki LR, Gibson CS, Crouch LD, Marx DB, Pandey JP, Nickel JC. Speed of tooth movement is related to stress and IL-1 gene polymorphisms. Am J Orthod Dentofacial Orthop 2006;130:698 e1-9. 34. You ZH, Fishman LS, Rosenblum RE, Subtelny JD. Dentoalveolar changes related to mandibular forward growth in untreated Class II persons. Am J Orthod Dentofacial Orthop 2001;120:598-607. 35. Lo RT, Moyers RE. Studies in the etiology and prevention of malocclusion: I. The sequence of eruption of the permanent dentition. Am J Orthod 1953;39:460-7. 36. 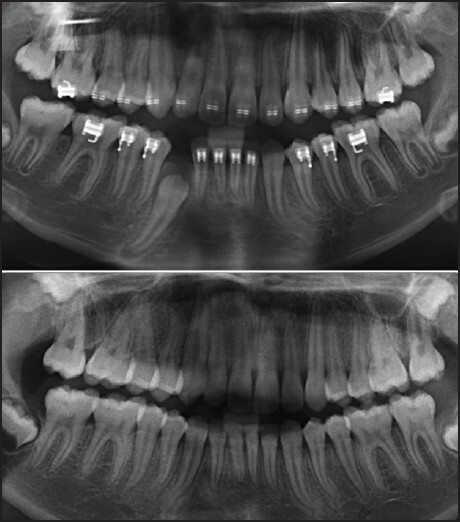 Suri L, Gagari E, Vastardis H. Delayed tooth eruption: Pathogenesis, diagnosis, and treatment. A literature review. Am J Orthod Dentofacial Orthop 2004;126:432-45. 37. Marshall S, Dawson D, Southard KA, Lee AN, Casko JS, Southard TE. Transverse molar movements during growth. Am J Orthod Dentofacial Orthop 2003;124:615-24. 38. Marshall SD, Southard KA, and Southard TE. Early Transverse Treatment. Semin Orthod 2005;11:130-9.